(《複数形》 音節‐gi 発音記号・読み方/fˈʌndʒɑɪ, fˈʌŋgɑɪ/，funguses)不可算名詞 [個々には 可算名詞] 真菌類，菌類 《mushroom，toadstool，mildew，mold を含む》. Borrowed from Latin fungus (“mushroom”). (mycology) Any member of the kingdom Fungi; a eukaryotic organism typically having chitin cell walls but no chlorophyll or plastids. 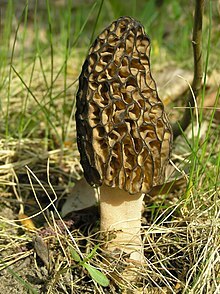 Fungi may be unicellular or multicellular. Originally sfungus. Likely a loanword from a non-Indo-European substrate language. Compare Ancient Greek σπόγγος (spóngos) (whence Latin spongia) and Old Armenian սունկն (sunkn).